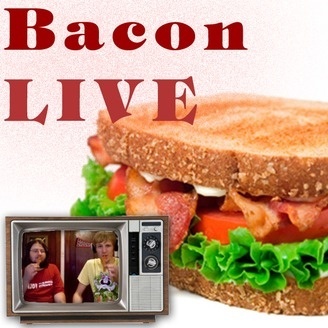 Bacon LIVE is an interactive podcast about bacon, beer, and anything else we find interesting. One season 5 episode 19 (http://blip.tv/bacon-live/bacon-live-bacon-crime-and-the-return-of-the-double-down-6269401) (recorded on May 30, 2012) we talked about the rise in bacon crime, a fisherman that catches wild bacon, bacon taxes, the return of the KFC Double Down, the worlds biggest meat sandwich, yet another bacon burger, Bacon Salt competition, and a store about what Sean ate. 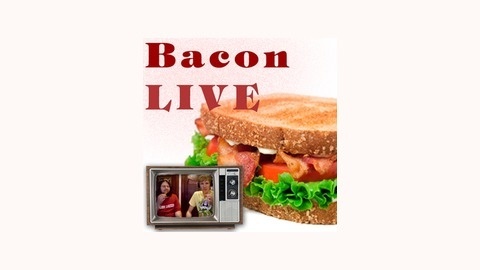 Go to BaconLIVE.com (http://baconlive.com) to learn how to subscribe and/or watch us live Wednesdays at 7pm ET!